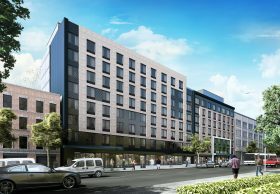 149 affordable units are becoming available at a newly constructed building in the East Tremont neighborhood of the Bronx. Located at 4181 3rd Avenue and 1888 Bathgate Avenue, the rental building, known as The Wilfrid, offers an impressive menu of amenities including an on-site resident super, a virtual doorman, an outdoor terrace, a fitness room, a residents’ lounge in each tower, laundry, parking and bicycle storage. Qualifying applicants earning 40, 50, 60, 90 and 110 percent of the area median income can apply for units that range from a $462/month studio to a $2,136/month three-bedroom.